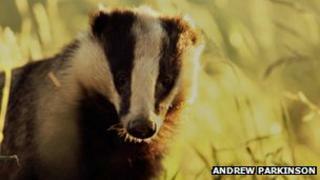 The badger cull in England will cost the taxpayer much more than it saves, an analysis by a UK expert suggests. While farmers may see economic benefits, the public costs of licensing and policing will exceed £1m in each pilot area, claims Prof John McInerney. Shooting badgers is not a good deal in economic terms, the former member of the government's Independent Scientific Group on cattle TB, says. The NFU said it supported the policy as "TB is getting worse not better". Professor John McInerney bases his estimates, which have not been published, on Defra's bovine TB impact assessment. Based on culling in a 150 sq km zone (smaller than the pilot areas) over four years, he said the total costs amount to £1.55m. Of this, £215,000 is the cost to farmers of paying for shooting the badgers, while the cost to the public purse for the likes of licensing and policing amounts to £1.335m. Assuming bovine TB falls by 16% over nine years, as estimates from the Department for Environment, Food and Rural Affairs (Defra) suggest, the economic benefits will reach £972,000, he said. This adds up to a net saving for the farmer (£215,000 cost vs £324,000 benefit) but a net cost to the public purse (£1.335m cost vs £648,000 saving). "Overall it's not a good deal," Prof McInerney, emeritus professor of agricultural policy, University of Exeter, said. "It's a good deal for farmers, given how much they pay towards it, but it's a bad deal for taxpayers in strict economic terms." But he added: "That does not include any of the personal, social costs or stress, or the costs or value associated with badgers themselves." Andrew Praill, of the British Veterinary Association and president of the British Cattle Veterinary Association, described the figures as "simplistic". He said it was evident that farmers were committed to the policy as they were prepared to deposit funds to cover the costs of shooting badgers. "There is fair evidence that the farmers are confident that they are going to end up with a positive result," he said. Commenting on the estimate, revealed at a briefing by scientific experts in London, the NFU said it supported the government policy of culling badgers because "TB is getting worse not better". NFU President Peter Kendall said: "34,000 cattle were culled in Great Britain last year alone because they reacted to a TB test. No cattle vaccine is available, and one with the ability to provide near whole herd immunity is years away. "Badger vaccine is being used and will continue to be used as part of the package of measures in this policy to try and halt the spread of TB. "But we must remember that no other country in the world has ever got on top of this disease without also tackling the reservoir of infection in the wildlife host, thereby breaking the cycle of infection between badgers and cattle." Two pilot culls have been given the provisional go-ahead in Gloucestershire and Somerset, which will involve the shooting of free-running badgers over large areas for the next four years. The Gloucestershire zone covers 300 sq km, while the Somerset pilot zone is 250 sq km. Farmers say the cull is necessary to stop badgers spreading TB to cattle, a problem which cost farmers and the government an estimated £150m last year. The policy has caused heated debate, with backbench MPs securing a parliamentary debate on the issue in the wake of an e-petition which has been signed by more than 150,000 people. Wales has chosen to follow a policy of vaccinating badgers, while Scotland does not have a TB problem.